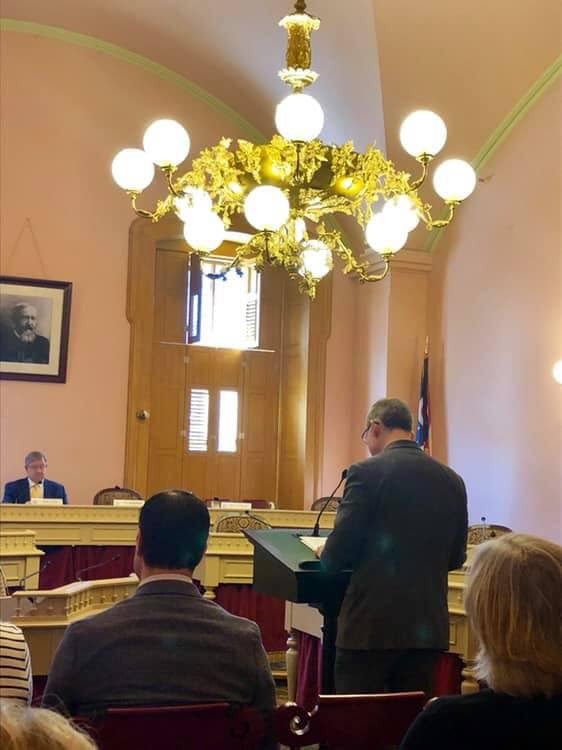 April 9, 2019 | OEA VP Scott DiMauro (standing) testifies about HB 166 to the House Finance Primary and Secondary Education Subcommittee. Good morning Co-Chairmen Cupp and Patterson and members of the House Finance Primary and Secondary Education Subcommittee. My name is Scott DiMauro. I am a high school social studies teacher from Worthington with 16 years of classroom experience, and I currently serve as Vice President for the Ohio Education Association. Let me begin by saying OEA and our membership are encouraged by recent efforts to address school funding. OEA has long advocated for state lawmakers to address the shortcomings of Ohio’s school funding system. Ohio’s current school funding system falls short of meeting the needs of students and the school districts that educate them. Ohio must end the band-aid approach to a formula that is not driven by what constitutes a high-quality education. OEA believes that Ohio should enact a student-centered formula that is equitable, adequate, predictable, and that ensures that all students have the resources to succeed regardless of where they live or their family’s income. Additionally, the school funding formula should directly fund charter schools in a way that is fair to both school districts and charters, as well as local taxpayers. Under House Bill 166, an additional $550 million would be provided over the biennium, outside of the formula, to support disadvantaged students by providing wraparound services, mental health counseling, physical health care services, mentoring, professional development when trauma-driven care may be required, and other means of addressing student needs. The bill requires school districts to develop plans for utilizing this funding in coordination with at least one community partner. The funds would be distributed based on the percentage of students in poverty in a district. Research tells us that when educators, parents, and community members collaborate to identify problems they will find solutions to meet unique needs of their students. This collaboration is particularly important in high-poverty communities. While not currently included in the budget bill, I would like to share OEA’s thoughts on the Fair School Funding Plan (FSFP). First, OEA would like to extend our sincere appreciation to the Chairmen of this committee, other legislators, and education leaders for their hard work and commitment to craft solutions to Ohio’s inadequate school funding formula. The FSFP school funding formula focuses on what students need to receive a high-quality education. It is built around the importance of supporting classroom instruction as well as focusing on social and emotional support, co-curriculars, safety and security, educator professional development, and technology access. The formula also provides additional special education funding, expands early childhood education opportunities, and provides increased transportation support. Additionally, OEA supports the FSFP proposal to direct fund charter school and voucher students rather than the current district pass through funding system. Under the current funding system, too many school districts are forced to subsidize the difference between the full per-pupil charter school deduction and the lower per-pupil state aid that a district receives. This results in local public schools having to either cut services for their students, tap into local revenues, or both. Direct funding of charter school students will move Ohio to fairer system that doesn’t pit charters schools and school districts against each other. While there are many positive aspects of the plan, OEA is concerned that 19 of the 71 districts in FY 2020 that are slated to receive no additional funding are among the poorest in the state. On average, in these 19 districts approximately 95 percent of students are economically disadvantaged and 70 percent are minority students. OEA recommends that further improvements be made to the FSFP formula to ensure that additional state resources are directed to districts with higher populations of disadvantaged students in order to work towards closing the education opportunity gap. OEA looks forward to working with members of the legislature to build upon the foundation laid by the Fair School Funding Plan to finally deliver the school funding system our children and communities deserve. OEA opposes all of the Academic Distress Commission language in HB 166 (“Interventions for low-performing school districts”) and asks that this language be removed from the bill. The provisions regarding Academic Distress Commissions in HB 166 would result in a vast and rapid expansion of state power over school districts and is antithetical to local control. It should be viewed with alarm. Under HB 166, the state superintendent and the Ohio Department of Education (ODE) would take over many more districts, much faster. The state superintendent would effectively assume control of a school district as soon as a district receives its first “F,” at which time the school district must enter into an expectation and support agreement with the state superintendent and ODE. When a district receives a second consecutive “F,” the state superintendent can take full control of a district by placing it under an Academic Distress Commission and a CEO. This complete takeover is a year earlier than would occur under the current failed state takeover law. There is broad consensus and evidence that the state takeover law has not helped local school districts. We believe it is time to repeal the failed state takeover law and restore local control. HB 166 does neither. HB 166 requires the Ohio Department of Education (ODE) to make recommendations on the feasibility of new funding models for charter e-schools. OEA commends the ongoing efforts by the Ohio General Assembly to gain control over the way in which charter schools, charter school operators and vendors can be paid. The Ohio General Assembly should seek to resolve the substantial and peculiar problems related to the distribution of General Revenue Funds and local property taxes to charter schools and their related entities. The 132nd General Assembly wisely created a legislative panel to review the well-known irregularities in charter e-school funding and the public awaits final recommendations. The provision in HB 166 that requires ODE to conduct a similar review of e-school funding should not supplant the ongoing work of the legislative panel. OEA views a legislative panel as the most effective means of developing solutions to ingrained problems with e-school funding. HB 166 proposes a program called “Quality Community School Support.” Under the program, ODE must pay each charter considered to be a “school of quality” $1,750 in each fiscal year for each student identified as economically disadvantaged and $1,000 in each fiscal year for each student that is not identified as economically disadvantaged. Instead of increasing per-pupil charter payments based on benchmarks that cater to charter operators, OEA asks the General Assembly to take comprehensive action to prevent ongoing fraud and widespread irregularities in current per-pupil charter school payments. This should be addressed before any additional money is provided to charter school operators. In addition, any effort to define “quality” should be based largely on the students, not the charter school operators. Six of the eleven charter “quality” indicators in this cash bonus program are based on extraneous benchmarks related to school operators. Only two of the eleven “quality” categories are based on students. Again, until there is greater accountability and transparency in Ohio’s per-pupil charter school payment system the proposed “Quality Community School Support Program” poses an unacceptable risk for Ohio taxpayers. OEA recommends that the General Assembly complete its review of e-school funding models before proceeding on proposals to expand per-pupil payment amounts to charter schools. HB 166 proposes a procedure by which two or more community schools may merge that includes adopting a resolution, notifying ODE, and entering into a new contract with the surviving community school’s sponsor. OEA opposes the charter school merger provision, which would circumvent a major charter school reform enacted by the 131st General Assembly in House Bill 2. In part, House Bill 2 sought to prevent charter schools from avoiding accountability laws through sponsor-swapping or closing and re-opening under a different name. House Bill 2 requires charter schools to receive approval from ODE before taking these actions. Chairmen Cupp and Patterson, this concludes my testimony. OEA looks forward to working with the legislature on making improvements to House Bill 166. I would be happy to address your questions.